If you think the modern kitchen has everything you could ever need, think again. We’ve already featured the Froot Guard. 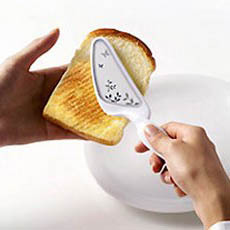 Now we found some of the strangest, coolest and most clever kitchen gadgets ever conceived! 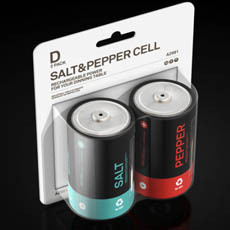 Give your meals a boost with D-Cell Battery Salt & Pepper Shakers! 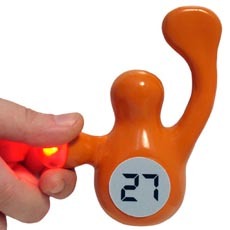 See how much “power” (or pepper) you have left through the power indicator panels so you know when to “recharge.” Not available for sale just yet, these will eventually come in red and turquoise or black and white. Sure you can blame the oven, but we both know the kitchen fills with smoke every time you cook because you’re just that bad at it. It’d almost be funny if it weren’t for that annoying smoke detector going off every time you cook. Rather than blaming the smoke detector for doing it’s job, why not get a remote control smoke detector silencer? Smokey the Silencer can’t help with your culinary deficiencies, but he can help make cooking a little less stressful. If your spice rack can’t take another jar of paprika then maybe it’s time you rethink your seasoning storage. 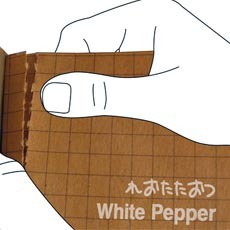 The Spice-Leaf Book solves the problem of space by storing a variety of spices in a handy little book. Just tear off a page of dissolving paper packed with seasoning and toss it in your stew. Of course it’s just a concept, but we’d love to see this clever little “cookbook” make its way to our kitchen. 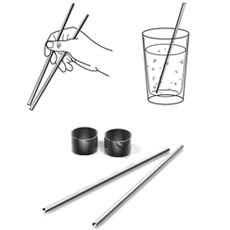 Maybe space in Asia is more limited than we thought because we never could have imagined the need for an all-in-one chopsticks/straw/napkin holder/bracelet—those are all pretty compact as it is. The idea behind the Roll n’ Roll tool is that it would be completely flexible in any direction resulting in the most versitaile and easily stored kitchen utensil/accessory ever. We imagine the only way to really guarantee perfectly crisp toast is to toast your bread manually. How great would it be to eat a warm piece of toast on your commute on the train, even when you’re running late? This kitchen concept would be great to keep in your bag or desk and have toast whenever you want. 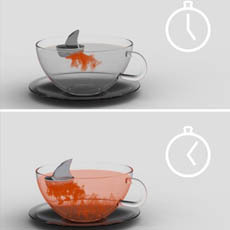 A creative twist on your average mesh ball tea infuser… Pablo Matteoda adds excitement to tea time with Sharky Tea Infuser. Add some loose tea and let it ominously float around your water until you have the perfect cup of tea. It could only be better if it included a small speaker that played the JAWS theme. 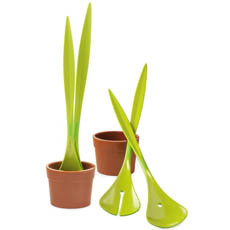 A simple elegant potted plant suddenly becomes salad servers and a dish for dressing. Salad Plant Flower Pot makes a useful table topper that will surprise your guests when you suddenly pluck the leaves to start tossing salad. 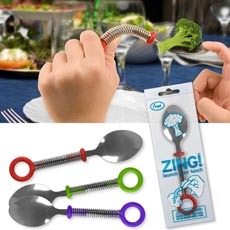 If you’ve ever competed with your siblings to see how could get more air on a piece of broccoli, then Zing Spring Spoons are for you. Playing with your food has never been so fun. Just pull back the handle and watch the food fight unfold before you. It’s hard enough to get the food from your plate to your mouth let alone to the sauce dish without a disaster. 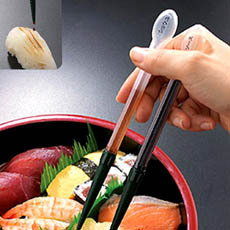 Save yourself a step (and an embarrassing soy sauce mishap) with Sauce Dispensing Chopsticks. Just squeeze the end to drip a little sauce on your sushi. 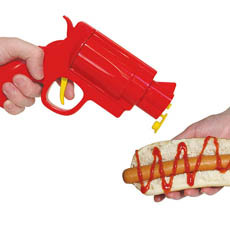 Combat boring hotdogs with the Condiment Gun. Load it up with your favorite ammunition (aka condiment) take aim and fire away. Get two and double wield ketchup and mustard and become the quickest draw at the picnic. There are all kinds of products that make cooking easier, why not make eating easier too? 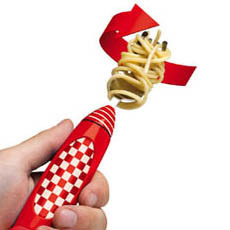 The Spinning Spaghetti fork does all the work for you by automatically winding up your pasta. As convenient as that is, it does not however help you chew or swallow. 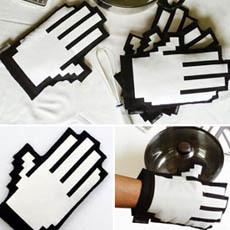 If you have trouble transitioning from using the computer to using the kitchen, this should help. Just “click” on your pots and pans and “drag” them to your stove to start cooking. Just make sure your food doesn’t overheat or your meal might crash. If you only use jelly for PB&J’s then you might not realize that whoever uses the jelly after you for their toast doesn’t appreciate the peanut butter you left behind. 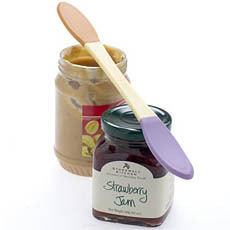 Be a little more considerate without using an extra butter knife with the Peanut Butter and Jelly Spreader. It’s even color coded so you’ll have no excuse next time there’s peanut butter in the jam. Here’s a kitchen product that’s udderly delightful. 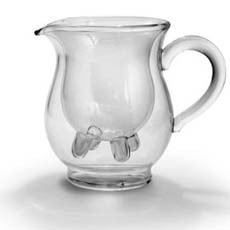 If you’re not a fan of the cow puns, hopefully the Calf and Half jug will put you in a better moooooood. Seriously, we’re done. We’ll just shut up and drink our milk now. The Titanium Spork takes a fantastic idea and makes it better. Sporks are already pretty high up on the list of awesome achievements of man, so it seems a shame to toss them when you’re done enjoying a tasty meal with only one utensil. Never again will you have to part with your favorite eating tool with the Spork of the Gods. Fight hunger with your weapon of choice. When you are investing into these gadgets learning how to use them can be quite difficult, which means quite a lot of mess. Why not invest into a splashback in your kitchen to make sure the mess doesn’t go all up the walls. Not sure if the spork counts as a cool gadget. 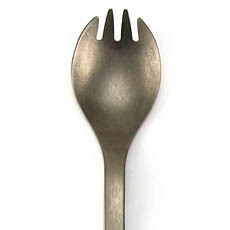 It’s been around forever and is a common backpackers utensil. Love these gadgets!! All cooks/ bakers appreciate things like these. Hope my kids never see the zing spring spoons…..
@Gunjan The images link to more information about the product. Unfortunately I believe the portable toaster is only a concept design and does not actually work. Love the clean layout of this site and also the very interesting items covered. Found many things here I had never come across.